It’s dual layer, I’m afraid. it’s very much designed for fabrication plants rather than a mill. i will investigate further and report back. the mill is at GE’s experimental community makerspace-like facility here in Louisville called FirstBuild. it’s probably a little more capable than a lot of the hobbyist ones you might see around but limitations are limitations! nods. I think my concern would be lining up side A and side B! Regarding the panels, I posted some .fpd files a few days ago in the EU group buy thread ( you can find some files for acrylic panels there too, without countersink). I think they have smaller countersink, not sure but it’s the ISO standard for M2.5 If a groupbuy happens in EU, I’ll probably modify the files and replace the holes on the top panel with blind threaded holes. The only information about the i2c cable length to connect the 16n to a modular (TELEXb) I can find is “as short as possible”, so the 16n has to be placed right in front of the modular? I’m dreaming of placing my modular next to my (MIDIfied) upright piano and a 16n / Grid / Ansible on the music stand, but I’m afraid that’s not possible? Is there no way to amplify or rebuild the i2c signal actively like with active amplifier boxes for longer USB connections? Here’s an IC that might be able to help you create a longer-distance I2C run. hopefully without annoying him too much: @bpcmusic is probably your best bet for I2C questions. Thanks, I won’t be able to build this myself, but interesting that it seems to be possible. Would it be theoretically possible to mount four pushbuttons (latching) instead of four of the faders? ah, yep - that’s right. The outs are ‘raw’, not processed, so you can’t adjust their behaviour in code. Depends on your definition of ‘mount’. It wouldn’t be pretty. You will probably need to add pulldown resistors as well as the switches, and then your switch is pushing the channel high, and otherwise, it’s pulled down to 0. That would require flying leads and so forth, you’re not just going to snap them into the board. You might also consider adjusting the firmware to replace those channels with note on/off messages rather than 0/127 CC messages, which map to buttons better. Or: you could take the source files and modify them to make the thing you want. It’s actually a reasonably straightforward modification. But there is a way to bodge it, though it’s ugly and might need a slightly larger enclosure. 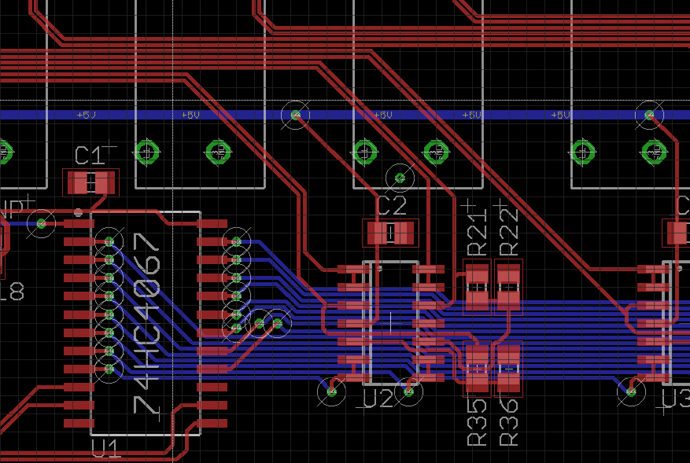 Looking at the schematics, I feel that not breaking out some of the unused pins from the Teensy is a bit of a missed opportunity. A sidecar with an SPI/I2C output expander and some buttons/LEDs/tiny eBay OLEDs would be interesting. It’s probably easy to bodge the wires on, mind. we considered this breakout pins - there was some discussion about what ‘hackable’ means if the pinouts are fixed. We also talked a lot about expanders - the CV functionality at one point was considered an expander - but to paraphrase an old tail about regular expressions, the moment you start bringing up expanders, now you have two problems. In general, with regards to feature creep, I refer to my post from December 2017. Blimey. This took me a while. @dewb - that i2c part (IC) is cool. Thanks for sharing! @rklem - the distance you can run all depends on what your i2c bus looks like (how many instruments are connected and how are they wired). I’ve personally kept my 16n connection to 1.5 feet (0.4572 meters) to be on the safe side. But, I have a lot of instruments connected on my various busses. I would recommend using USB or serial MIDI for long runs at this point.